For those of you who don’t know, the decision was made to put ShinBi to sleep. It was, perhaps, something that we could have predicted and perhaps some will say what Southland Collie Rescue did was just stalling the inevitable. I’ve thought about this a lot. I have in the past made the decision for my own dogs when it was time. This was not my decision, but I respect the judgment of ShinBi’s foster mom, Sue Baldwin. 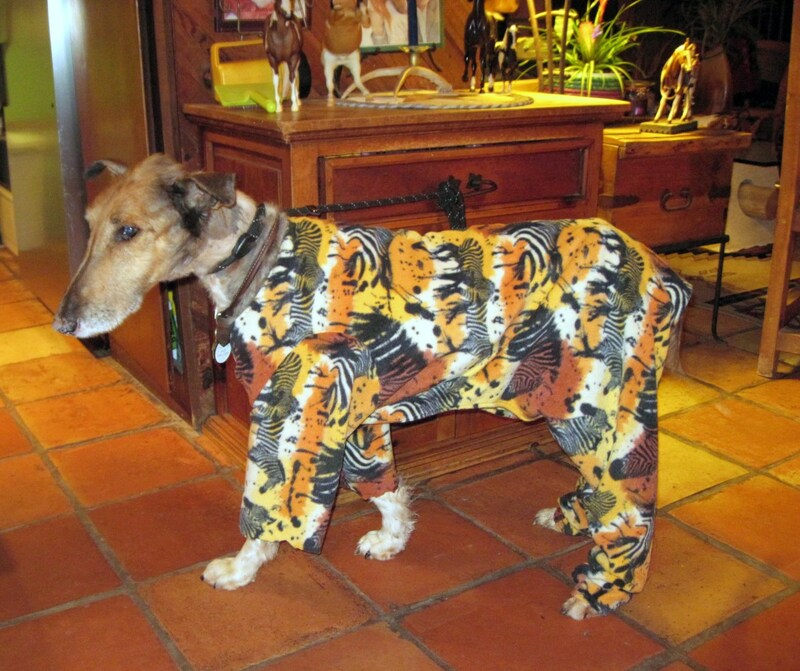 Baldwin is the person who matched me with my first rescue collie, Laddie. 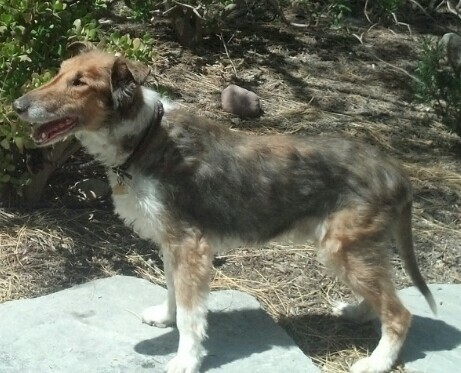 She then matched me with Bodhi, my first smooth collie. Laddie and Bodhi are now long gone, dying at about 10 and 14 respectively. We do not know the age of ShinBi. We only know that when he was first pulled from the shelter in South Korea, he was alert and he pranced. Yes, he pranced. By the time he got to the U.S., landing in 20 February 2014, he was very thin and very ill. He was also a very lucky dog. He should not have made it to the U.S. because he had heartworm. We learned that heartworm doesn’t show up until there are adult worms who had mated and propagated. ShinBi came in just before that happened. 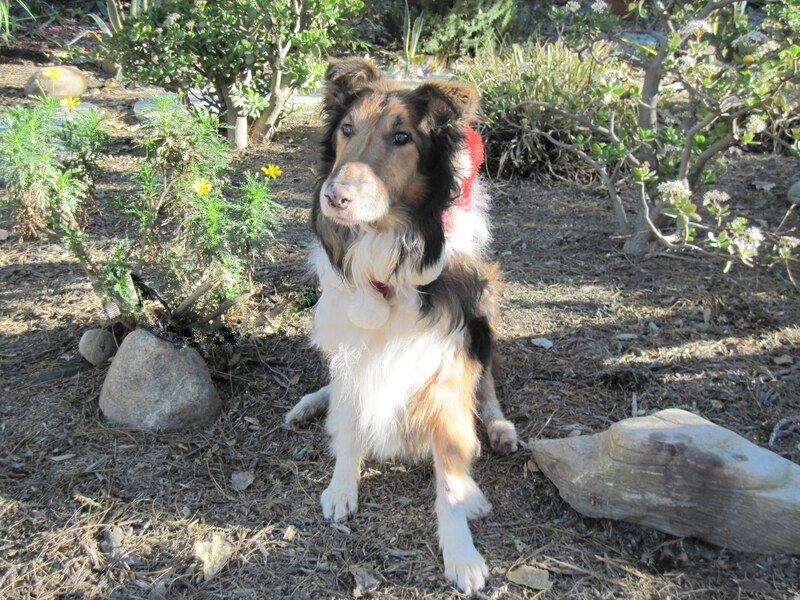 Southland Collie Rescue then faced the long and expensive medical journey required to treat heartworm and diabetes. I learned a lot about heartworm and expect to look even more into the experience of the owning a diabetic animal. Although I originally raised the money to bring another dog, Kobe, over from South Korea, bringing over ShinBi forced me to do more than one GoFundMe campaign. We needed to raise money to cover his medical costs. 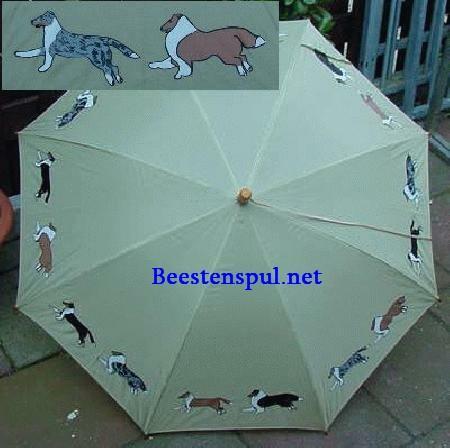 As I and my collie friends learned more about the possibilities of GoFundMe, we also had other collie-related crises. 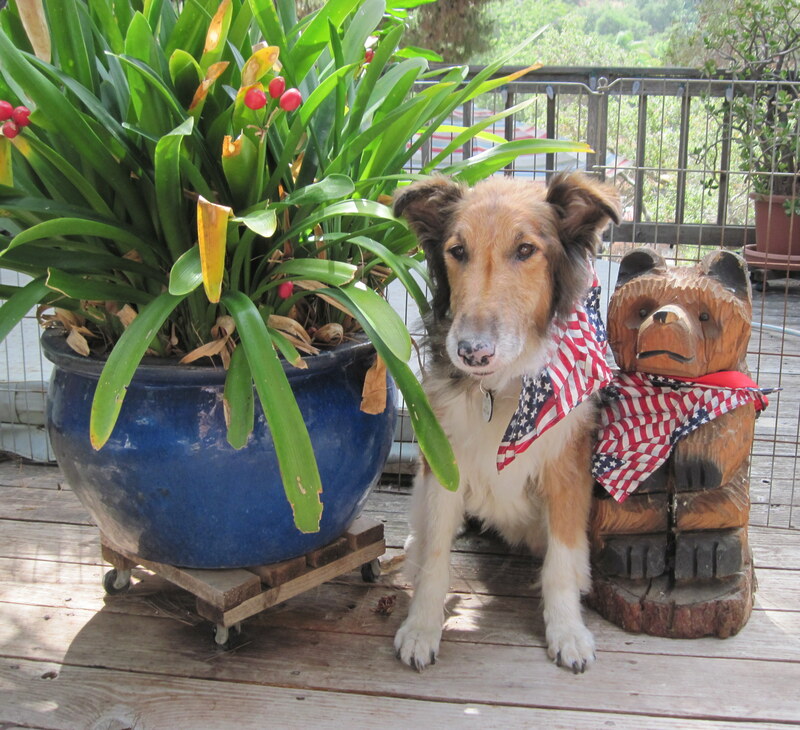 I was able to, with varying success, help other rescues using GoFundMe, including Rocky Mountain Collie and Sheltie Rescue, especially for their Dallas the dog GoFundMe campaign. When ShinBi arrived at LAX, I met Bert Grimm and his wife Shauna Hoffman. I also met a woman who loves purple just as much as I do, Kyle Orlemann. 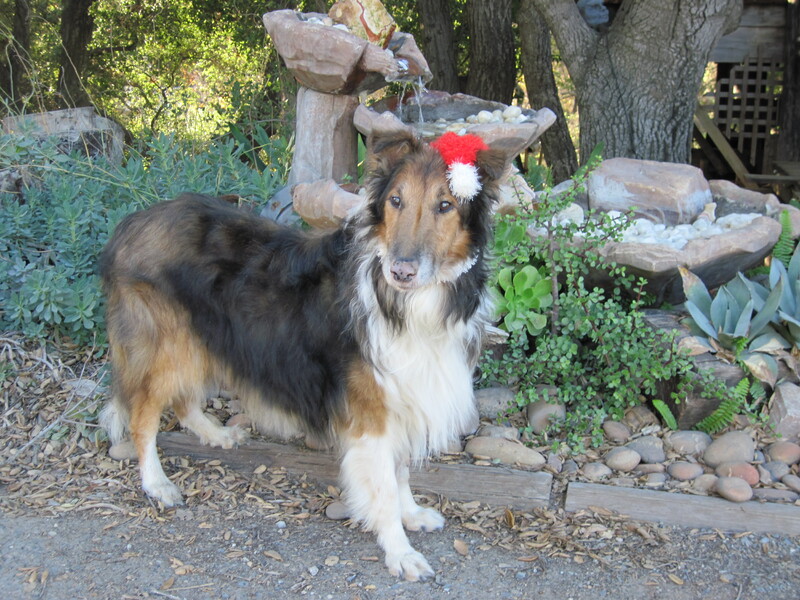 During the year and three months that ShinBi was alive in California, I raised money for an expedition that Hoffman took to Houston, Texas to bring back four Tomball collies and I was ready to start a GoFundMe campaign for Jerry Orlemann’s service dog Barak when Kyle wrote about his emergency medical crisis on Facebook. I know that some people will think that raising money to save a dog for only one year and three months might not be a good investment of time and money, and further, to raise money for an eye surgery for a dog who lives only one month past the surgery was a waste of resources, but for a collie, one year is like seven human years to a dog. One month is like seven months. 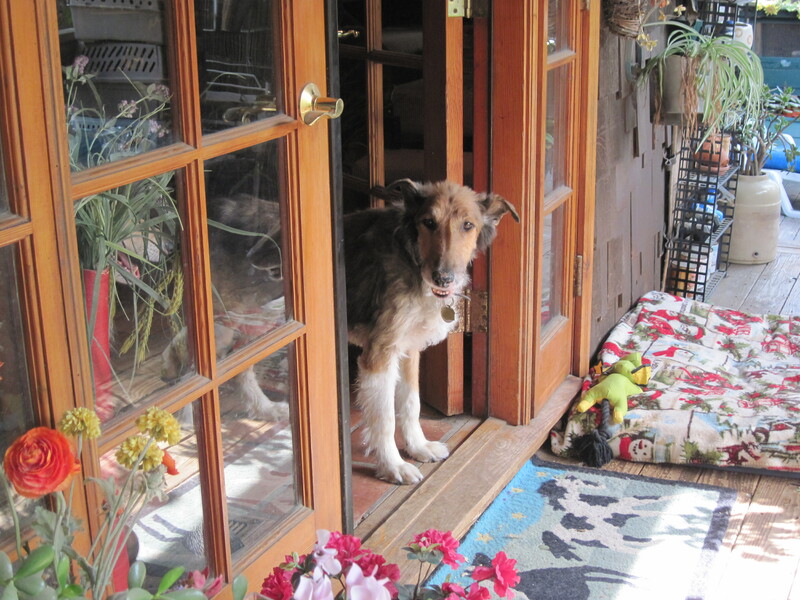 ShinBi was warm and happy and loved, not just by Sue Baldwin, but by Southland Collie Rescue and many of his fans. 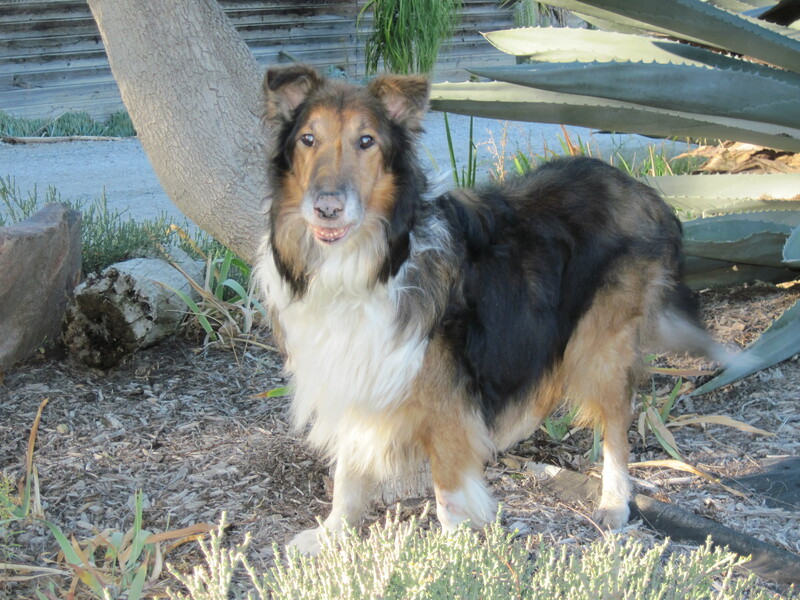 ShinBi was a collie that required a dedicated community to raise, a community that I didn’t know existed until ShinBi came to California. Thank you for all of your kindness and generosity. We’re sure you’ve been busy this weekend. We hope you had a lovely Thanksgiving feast and avoided any unfortunate incidents on Black Friday. ShinBi continues to be a high-maintenance dog. He probably NOT have found an owner in South Korea who could have dealt with all of his health issues: heartworms, compromised liver and diabetes. Yet it should remind us, that we have been truly lucky. This is the first time that Southland Collie Rescue has dealt with a diabetic dog, but hundreds of cat and dog owners do so each day in the United States. One article estimates that every one in fifty pets has diabetes. The good news is: ShinBi is over the first hurdle–heartworms. Now we have to get his diabetes under control. Unfortunately one of the side effects of diabetes is cataracts. Sue Baldwin has consulted with a specialist, Dr. Julius Brinkis at the Tustin practice of Eye Care of Animals. 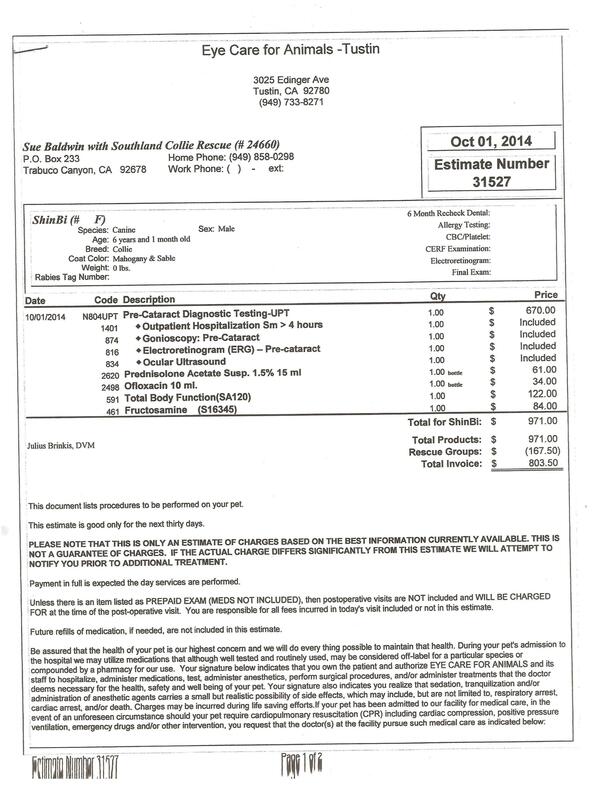 At ShinBi’s second appointment on 30 October 2014, ShinBi’s eye pressure had improved from 7 to 10. His eyes looked good. Dr. Binkis would like to see ShinBi’s eyes in the low teens. ShinBi is taking Diclofenac twice a day for both eyes. It’s expensive–$58 for about 20 days. We hope that he will go down to once a day in the future. ShinBi’s blood glucose is still a concern. The doctor wants ShinBi to be fairly level. According to the doctor, a dog can take about one half of his body weight in insulin. ShinBi now weighs about 55 pounds so she should be okay for 27 units. He is currently on the short-term insulin called Vetsulin. If ShinBi doesn’t stabilize on 27 units, then we will consider a different insulin. Dr. Binkis wants to see him back in three months–that would be in January. If Dr. Krause, ShinBi’s general vet, feels that his condition has improved, ShinBi might see Dr. Binkis earlier. Dr. Binkis, however, is in no hurry to do the cataract surgery because doing the surgery early won’t make a difference. ShinBi must be anesthetized for further tests to see if the cataract surgery is going to help. If things look good, then the surgery must be done in three months or the tests must be re-done. The tests themselves will run about $800. The actual cataract surgery will be an additional $3,167–and that’s with a discount for SCR. 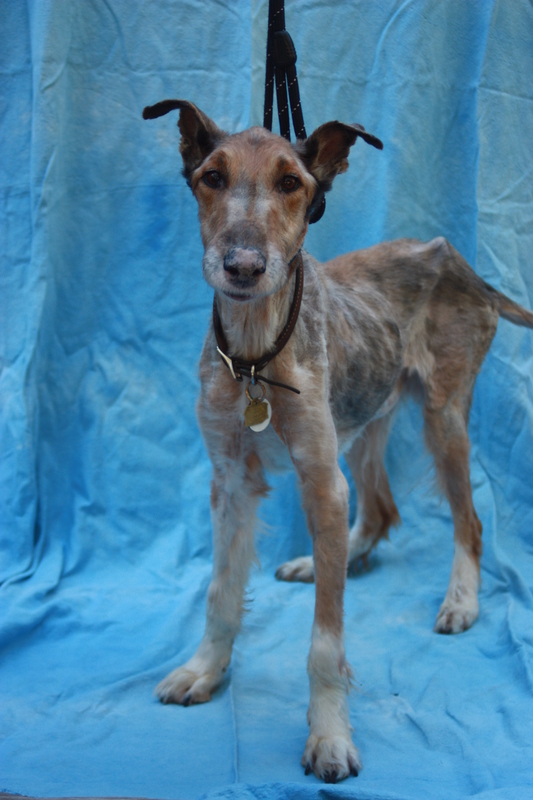 Currently, ShinBi is a long-term foster. 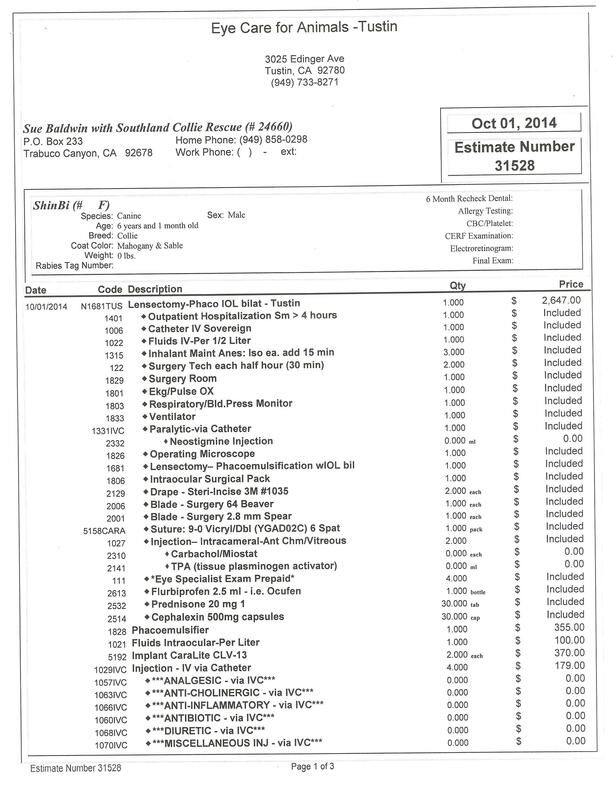 His meds cost about $485 per month. What we would like to do at this time, is ask all of our generous sponsors to think of things you don’t need. We are planning on having a fundraiser garage sale in the early spring. Save things that you don’t need. Save things that you don’t want. After the holidays, save things that you can now replace because of the great holiday gifts you received. If you see a two-for-one, consider giving one for the garage sale. We were told that items selling for $1-$10 go the fastest. We are also thinking of getting to meet all of our wonderful sponsors, perhaps in having fundraisers at Ruby’s Diners. Ruby’s Diner will give us 20 percent of all food and non-alcoholic sales we bring in. For ShinBi that would be about 250 people spending $10 or 125 people spending $20 (if my math is correct) for the $500 we are spending on meds. Ruby’s has vegetarian and gluton-free options. Lastly, I want to include photos of ShinBi. This dog wouldn’t be alive if it were not for our very generous sponsors. ShinBi is our dog and you are his angels. Happy Holidays. Diclofenac is usually given for arthritis, but that’s not the only usage. Diflofenic is a nonsteroidal anti-inflammatory drug according to Drugs.com. It reduces substances in the body that cause pain and inflammation for for that reason is used for arthritis or ankylosing spondylitis. It can also be used to treat migraine headaches but not to treat cluster headaches. We don’t know if our sweet ShinBi had headaches, but he does have problems with his eyes. This is a drug with serious side effects and should only be used under prescription from a doctor or veterinarian. It is useful in lens-induced uveitis in dogs and may be a pre-operative and postoperative agent for uveitis associated with eye surgery. Now you ask what is uveitis? Uveitis is the escape of lens proteins into the eye fluid that is most frequently associated with cataracts. Cataracts begin as a cloudy or dull appearance in the front of the eye and then the iris becomes unevenly colored with yellow or white areas. About 75 percent of dogs with diabetes develop cataracts within nine months of being diagnoses. If the lens-induced uveitis goes untreated and glaucoma also develops, cataract surgery might not be possible. Glaucoma causes chronic headaches.